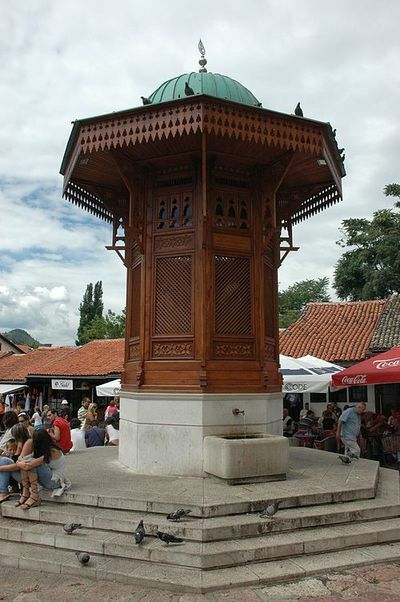 Šebilj (fountain), 18th c. CE, Sarajevo – Photograph 2008 by Josep Renalias, Via Wikimedia Commons. Two of the most respected Muslim academics in Bosnia-Herzegovina have given lengthy interviews in which they condemned Wahhabism, or "Salafism," as the Arab-financed Islamist ideology is also known. Their sharp criticism was published in the aftermath of the October 28 shooting attack at the U.S. Embassy in Sarajevo, by a Serbian Muslim, Mevlid Jašarević, wearing the short pants and untrimmed beard characteristic of Wahhabis. Rešid Hafizović, a distinguished professor of Islamic theology at the Faculty of Islamic Studies in Sarajevo, warned last year that the "virus" of Wahhabi radicalism had "destroyed every chance" for the development of European Islam. Hafizović described Wahhabism as "a new plague," disseminated by "Muslim puritans and perpetual world fixers." Following the attack on the embassy, in which a Bosnian policeman and the assailant himself were shot, Hafizović was interviewed in the November 5-6 weekend edition of the secularist Bosnian daily Oslobođenje (Liberation). Under the title "Wahhabis are Coming for a Property Deed on Bosnia-Herzegovina," he warned, "I am not sure that the assault at the American embassy in Sarajevo marks a culmination in the tale of Wahhabism, considering the completely befuddled and, mostly only verbal reaction of the state institutions and the Islamic Community leadership to the Wahhabi rampage in this country. . . . The reaction of the top of the Islamic Community has always been understood by the Wahhabi gang as a tacit green light for their actions." In 2006 Hafizović caused an uproar when he declared that Wahhabis, as representatives of the state sect in Saudi Arabia, "have come to get our children, they came for their devşirme [a draft of young men imposed by the former Ottoman authorities]." Five years later, he emphasized, "Wahhabi militants no longer come only for our children, because that is a phase they have surpassed, and now they are coming for a deed of possession to this country and its institutions." Hafizović accused the Bosnian Muslim religious elite, led by chief cleric Mustafa Cerić, who is aligned with the Egyptian hate-preacher Yusuf Al-Qaradawi, of simple greed. They have favored the Wahhabis, because the Wahhabis offer them money. "Not every Wahhabi is a potential terrorist," he added, "but it is hard to know when, and under what circumstances some mild-mannered Wahhabi will become a militant activist and agent of terror." He reproached Cerić and his deputies for holding on to the Bosnian Islamic administrative apparatus for 20 years, during which "their two worst mistakes were the coalition with Wahhabism and their involvement in political life which allowed them to build skyscrapers (towers of Babylon) in the Bosnian towns, from which they can now contemplate how Bosniaks die in a poverty for which their religious and political leaders are responsible." The same weekend, Professor Esad Duraković of the University of Sarajevo, the outstanding Bosnian scholar of Arabic literature and translator of the Koran and The Thousand and One Nights, spoke in a similar idiom, to the secular, wide-ranging cultural news portal Depo.ba. Duraković commented of Bosnia's chief Muslim functionary, "the main problem with Cerić . . . is that he has abnormal ambitions: He simply cannot be without a microphone and cameras, he always has to be the center of attention." Regarding the October assault on the American Embassy, Duraković said, "I predicted terrorist aggression of this kind, and even worse, in the media a few years ago, because I know well the nature and goals of Wahhabism. . . . It is not an expression of religion in a normal sense, rather it is a perversion of religion by politics; it is negative everywhere and is especially negative for Bosnian reality." He argued that Wahhabis fail to grasp that "acts like that at the American embassy . . . provide a crowning argument . . . for those who judged Muslims here as unacceptable and worthy of elimination" during the Balkan wars of the 1990s. "In that sense, Wahhabism is a distinctly suicidal ideology. . . . The act of exceptional violence at the Embassy was a terrorist act against a foreign, sovereign, and friendly country, but at the same time was a terrorist act of an extreme type against the Bosniaks themselves and the local Muslims." Duraković echoed Hafizović's warnings about Wahhabi ambitions toward the control of Bosnian young people. "They have entered deeply into the system, they educate the youth while the leadership of the Islamic Community is silent or flatters them as 'the new Muslims,'" he said. Both Hafizović and Duraković called on the Bosnian state to act against Wahhabi infiltration and further demanded that the Bosnian Muslim religious leadership abandon their posture of approval for Wahhabism and counter it by improving the quality of religious education and carrying opposition to Wahhabi doctrine to the ordinary believers. Duraković noted that while he attends Friday prayers regularly in different mosques in Sarajevo, he has yet to hear a preacher criticize Wahhabism or defend the Bosnian style of Islam. He added that everywhere he has gone in the Arab lands he has praised the distinct nature of Bosnian Islam, as "very simple, light, not overbearing. . . . 'Bosnian Islam' . . . has a special quality which I recognize and call an accentuated sense of tolerance." Wahhabism, he said, is "being exported into Bosnia-Herzegovina from Saudi Arabia, but it often arrives through Vienna and who knows where—even though Saudi Arabia is its homeland—and in Bosnia-Herzegovina it is defined as a movement, meaning that it seeks to conquer the land, having decided to occupy it in its entirety. The movement . . . now manifests its expansionist character, with intolerance as its fundamental principle."